The Larine Extendable Dining Table is designed with the clever engineering that often turns up in furnishings of the 18th-19th centuries, making a single piece multi-functional. With this extendable dining table, you get both a compactly proportioned table, suitable for kitchen or dining nook, and a modern dining table with ample space for four -- and it's done without hassling with a removable leaf, because the extension is built in. A quick turn and flip completes the transformation. 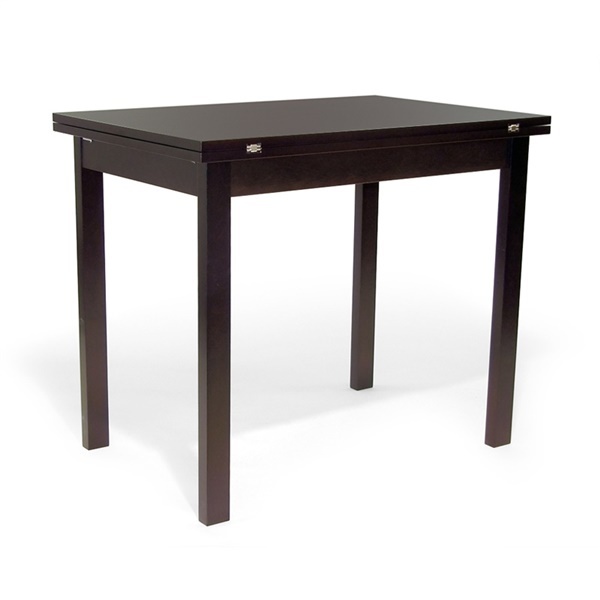 Both "sizes" of the Larine Extendable Dining Table are clean-cut, handsome, and sturdy, with a solid beechwood frame and beech-veneered particleboard top, all finished in your choice of color. This table is great for a small space. Fits nicely in my apartment. Perfect size for 2 to sit comfortably but easily expands to hold 4 when needed. Great quality and look. Arrived with a scratch but customer service was helpful and resolved the issue no problem. Highly recommend this table for any small space! A solid, functional, attractive table. It was delivered in perfect condition. The assembly was a breeze. Sturdy and love that it opens to double its size! Well made and great price! The table came well packaged,so much so that it took longer to get it out of the box than to put it together! Assembly consisted only of adding the legs using supplied parts, very easy and quick to do as the table and legs were well constructed and went together easily. Sitting upright, the table was very sturdy and heavy with a rich satin finish not super shiny (my preference). The rotation was smooth with little felt pieces attached to help it along and a locking mechanism underneath. Once flipped open, one side of the table was perfectly matched and even while the other side was slightly uneven right at the hinge point. However, my plate was still stable sitting there. For the price, that was nothing to complain about. Also customer service was very prompt and informative when I contacted them about shipping. Great buy for a little dining nook. Super easy assembly and very easy to use when extending! Convenient, built strong and a steal with the sale price! Dream table for eat-in kitchen and thinking it will make great extra seating for the holidays when a "kids table" is needed! Cherry wood finish is beautiful! I love that it's eco-friendly and its just the right size for my dining area even with the extension! This table was the perfect size for my eat-in kitchen and the extension was excellent for additional people (about 4). I'm very happy with my choice! super easy to extend, really nice finish, ultra smooth and matched even better than i thought with my dining chairs! The perfect gift for my daughters first apartment! She said its very easy to use and it expands easily accommodating 4 people when needed. Thank you! This table is a small classic reproduction from Scandinavia, on the order of a classic folding director's chair or classic folding outdoors chaise; the straight, unadorned wooden legs and simple door-hinge leaf connectors also work well as minimalist design. They also work well with their surroundings, unless, of course, your taste in interiors runs to Versailles and Le Petit Trianon knock-offs. As in a director's chair, you want the real deal, with the wooden arms and legs, rather than some pretentious, overdone imitation involving lots of chrome and glass, although some people out this way prone to gussy those chairs up by printing their name on the back of the seat rest. My table came in a lovely cherry finish and took about 10 minutes to assemble. Basically, it is hard to beat the price. ConsVeneer on top. Deal with it. I bought this table in color coffee and it is beautiful. The table is sturdy and it is real wood, when closed it is more than enough for 2 people and when it is open it is more than enough for 4 people. The table is well made. This is a great table and the color is very true to the picture. Plus this table made the list of the best 10 expendable tables. I am very happy with my purchase and happier yet with the easiness that it was to put it together. Now, the table is a little heavy but that is because it is real wood. I do recommend this table.